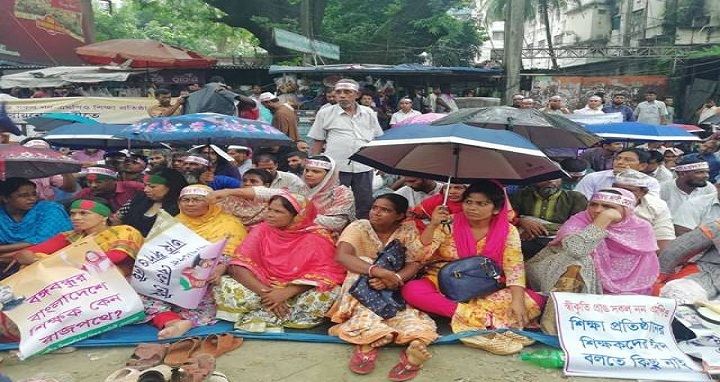 Dhaka, 25 June, Abnews: Teachers and employees of non-MPO educational institutions on Monday went on hunger strike for an indefinite period demanding enlistment of their institutions under the Monthly Pay Order (MPO) scheme. Under the banner of ‘Non-MPO Educational Institutions Teachers’ and Employees' Federation’, they started the strike around 10am in front of the Jatiya Press Club braving heavy downpour. The non-MPO teachers have been continuing their demonstrations for the last 16 days, said Dr Binoy Bhushan Ray, general secretary of the federation. Earlier on June 22, they submitted a memorandum to the President, but the government did not take any initiative to meet their demand, he said adding that they will continue their hunger strike until fulfillment of their demand. On June 10, they started demonstrations to press home their demand. Although they initially observed sit-in for half day every day, the teachers and employees went on a non-stop sit-in programme from June 18. On December 31, 2017, teachers and employees of non-MPO educational institutions had started observing hunger strike unto death to press for their demand and ended the strike on January 5 last after getting Prime Minister’s assurance of meeting their demand.